Our mission is to create luxurious, natural scents designed to star you. Starring Fragrances is the brainchild of former child actress, Ashley Peldon. A long time fan of personalized and unique fragrances, Ashley decided to create her own original concoctions of sensual sweet treats! Ashley says, "I'm passionate about this company. It is something I truly enjoy working on in my spare time. There isn't anything better than finding something to work on that you really enjoy!" Ashley started acting in her native New York when she three years old. She began with starring roles in multiple films opposite the likes of Diane Keaton, Bette Midler, and Goldie Hawn. At six, Ashley was the youngest child ever nominated for an Emmy Award. After moving to Los Angeles, CA, Ashley continued her busy career starring in popular television shows “The Mommies”, “The Pretender”, and “That 70’s Show”. She also kept her spare time full working on multiple films, like the cult classic “Drop Dead Fred”, alongside Winona Ryder in “The Crucible”, and with Scarlet Johansson in the Oscar nominated “Ghost World”. During her busy career, Ashley found time to earn her Master's Degree in Clinical Psychology. Ashley is now on her way to receive her PhD in Depth Psychology. 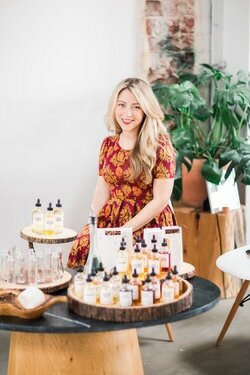 Ashley’s fragrances are hand crafted, completely unique, and are designed to Star You!